Losing a pregnancy is a devastating event, and even when the loss is during the earliest stages of pregnancy it is no less traumatic for many. 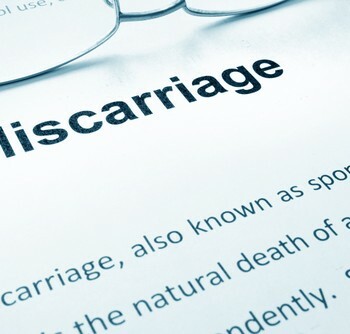 It’s important to know that between 15% and 20% of all pregnancies will end in a miscarriage, with most miscarriages occurring in the first trimester (before 12 weeks). While the risk of miscarriage does increase with advancing maternal age, most miscarriages are not preventable. And, although they are often heartbreaking, miscarriages are nature’s way of ending a pregnancy that is not developing as it should. For most couples, a single early pregnancy miscarriage is the result of a fundamental and completely random problem at the genetic level, which meant the pregnancy was not ever destined to continue. Although this can make us feel powerless, it also has some important positive implications for the couple’s chance of conceiving and maintaining a successful future pregnancy. First, the couple has proved their fertility – although nature intervened, they have demonstrated that they can fall pregnant. Second, their pregnancy loss almost certainly resulted from an isolated, sporadic genetic event that is unlikely to happen again. And, third, no-one is to blame for the miscarriage (more on this shortly). From this, we can conclude that the prognosis for the next pregnancy is excellent. In fact, after one miscarriage, a couple’s chance of another is unchanged (although it does rise slightly after two consecutive miscarriages). Many people worry that something they did, or didn’t do, caused their pregnancy to fail. This is a natural reaction to a traumatic event. using the oral contraceptive pill before, or in the early part of, pregnancy. Feeling guilty won’t serve any useful purpose, so try to set aside thoughts that these kinds of activities may have caused your loss. What can I do to improve my pregnancy outcomes? taking a folate supplement (0.5mg/day). See your medical professional to get more advice on any of these. Around 1 in 20 couples (5%) will experience two miscarriages in a row, and around 1 in 100 (1%) of couples will suffer from three consecutive losses. After two miscarriages, and certainly after three, it is worth seeking medical advice. Research shows that up to 50% of these couples will have an identifiable reason for their recurrent pregnancy loss. Treatments are available that can significantly improve their prognosis for future pregnancies. Research has demonstrated that close monitoring and support in early pregnancy does improve pregnancy outcomes. Although heartbreaking, early pregnancy miscarriage is a natural event and is nobody’s fault. A single miscarriage does not change your chance of conceiving or achieving a healthy baby in your next pregnancy. Two or more consecutive pregnancy losses may indicate a problem, and you should seek medical advice if this occurs. Many causes of recurrent pregnancy loss are treatable. Couples who suffer recurrent pregnancy loss with no identifiable cause still have greater than 50-60% chance of a future successful pregnancy (depending on maternal age). Ask your medical professional if you would like more information or advice on any aspect of miscarriage.